We’d love your help. Let us know what’s wrong with this preview of Fribbet the Frog and the Tadpoles by Carole P. Roman. Join Captain No Beard and his friends as they learn the value of sharing our troubles with others and that help is always there when we need it. To ask other readers questions about Fribbet the Frog and the Tadpoles, please sign up. This book is such fun. We love reading in all the different voices. Another lovely book in this series. Things are changing in Fribbet's home. He's not sure what to do. He tells Captain No Beard and his crew about these new, strange animals are everywhere. They changed too. The animals were taking up all of Mom and Dad's time. They had no time for Fribbet. The crew explains these are Fribbet's brothers and sisters. Hallie has a new baby brother too. I adore these stories. They are colorful and exciting. Each one captures the imagination of your child and let's them know anything is possible. The c Things are changing in Fribbet's home. He's not sure what to do. He tells Captain No Beard and his crew about these new, strange animals are everywhere. They changed too. The animals were taking up all of Mom and Dad's time. They had no time for Fribbet. The crew explains these are Fribbet's brothers and sisters. Hallie has a new baby brother too. I adore these stories. They are colorful and exciting. Each one captures the imagination of your child and let's them know anything is possible. The child in your life will love these adventures. The series should be part of every child's library. It’s a rocky boat for the crew of the Flying Dragon and hard work for Captain No Beard. Cayla is getting bigger and that means getting into more trouble, And Fribbet the frog is crying puddle of green. The captain has his hands full with Cayla and the crew are wringing theirs over Fribbet. But No Beard and Fribbet come to realize that families will grow and that’s a good thing as they’ll never be alone. You’re children will be delighted to learn about Fribbet and how tadpoles become glorious green It’s a rocky boat for the crew of the Flying Dragon and hard work for Captain No Beard. Cayla is getting bigger and that means getting into more trouble, And Fribbet the frog is crying puddle of green. You’re children will be delighted to learn about Fribbet and how tadpoles become glorious green frogs. I loved the subtle narrative about new siblings in a household and how frightening that might be for kids. Carole once again shows that learning and fun can be one and the same. Captain No Beard and his crew are off on another adventure when they discover a crew mate is missing. Upon searching the ship high and low, they soon discover Fribbet the Frog huddled at the stern. With gentle urging from his friends, Fribbet confesses that he is frightened because some strange creatures have appeared in his home. Fribbet describes how the eggs hatched into some fish-like critters that eventually grew legs and become little froglets who were noisy and who played with his toys. C Captain No Beard and his crew are off on another adventure when they discover a crew mate is missing. Upon searching the ship high and low, they soon discover Fribbet the Frog huddled at the stern. With gentle urging from his friends, Fribbet confesses that he is frightened because some strange creatures have appeared in his home. Fribbet describes how the eggs hatched into some fish-like critters that eventually grew legs and become little froglets who were noisy and who played with his toys. Captain No Beard reassures Fribbet that the creatures are, in fact, his brothers and sisters whom he will grow to love and appreciate. I highly recommend this wonderful picture book featuring colorful, kid-friendly illustrations, important life lessons about friendship and family, and a brief introduction to the life cycle of the frog to children ages 3 to 10. This would make a great read aloud book to an early elementary classroom or library reading circle. Award winning author Carole P. Roman has added Fribbet the Frog and the Tadpoles based on changes in her own family. The happy grandmother is delighted with her growing brood. She lives on Long Island with her husband and very near her children and grandchildren- the inspiration for her books. I love Captain No Beard and his crew. If you have been following me for awhile, you know I adore this series and do my best to review every addition that is made to it. A precious story that always involves Captain No Beard aka Alexander and his crew. You can not get through one of these stories without smiling. The author can nail it every time! I love everything about this crew and all the animals along with friends that add so much to each story. In this addition to the series, Fribbet the Frog and the Tadpoles, Fribbet tells his friends of the extra visitors he has at home and how his life has changed. He explains how unhappy he is. As he explains the Captain agrees with him on the subject of siblings. But he explains that even though it is hard work it is well worth it. A sweet, children's story modeling love and friendship and how both are blessings! **Disclosure** This book was sent to me free of charge for my honest review from Bostick. 5 Winners will win copy of this book. A GRAND PRIZE WINNER will the win a whole set of this series. click here to enter on my blog only. Captain No Beard knows he can count on his crew to pull their weight but that does not necessarily mean it always goes smoothly. Especially for the newest member of the crew, cabin girl Cayla. While distracted watching the chaos growing on deck the Captain hears someone crying and immediately goes to investigate. After all being a captain is hard work. He and his crew have always been there for each other and today they would be there for Fribbet. What in the world could Fribbet be so upset about that he could not stop crying long enough to tell them what was wrong? This story is a good example of being team players and pulling together when one of your crew needs support. I choose this series and author over and over again as the go to children books for friends and family. The author always goes beyond my expectations in her writings and generosity, like the giveaways she offers on my blog and others. Disclosure: I received a free copy of this book from the author for an honest review. I was in no way compensated for this review. My children love all of Carole P. Roman books. I am never disappointed in her work, and my kids love going an adventure through her books. Fribbet the Frog and the Tadpoles was no different. I am amazed at how much Carole's books seem to be attached to my little ones. I wish these books could be an Accelerator Reading book. I think we would read these all the times, and write them in my daughter's reading log. These books are THAT good! We got to know the life cycle of a frog, and I love the pirate My children love all of Carole P. Roman books. We got to know the life cycle of a frog, and I love the pirate language in this tale. We all have came to love Captain No Beard. It is such a wonderful experience to let a child read about being okay if you are frightened, and how friends are there to support you no matter what. I also enjoyed the part about siblings, it seems my daughter and son are in the "he/she is annoying me" stage, but it is okay to know that this is normal, and all siblings go through this. With that being said, siblings will always be there for you no matter what. Disclosure: I received this book for free from the author. I was not required to write a positive review. The opinions I have expressed are my own. Fribbet the Frog and the Tadpoles is a fun filled adventure on the "high seas" where Captain No Beard and his crew must help their friend Fribbet embrace the changes that are on the horizon. Captain No Beard watches as the crew cleans the ship or rather makes a bigger mess of things when he realizes Fribbet was missing. The crew searches the ship and finally finds him upset and crying. Wanting to be good friends, they offer their support. Fribbet begins telling them about the tadpoles that have t Fribbet the Frog and the Tadpoles is a fun filled adventure on the "high seas" where Captain No Beard and his crew must help their friend Fribbet embrace the changes that are on the horizon. Captain No Beard watches as the crew cleans the ship or rather makes a bigger mess of things when he realizes Fribbet was missing. The crew searches the ship and finally finds him upset and crying. Wanting to be good friends, they offer their support. Fribbet begins telling them about the tadpoles that have taken over his pond and how they hog all of mom and dad's time. Sharing his worries does make him feel a bit better, but now he's nervous about being a big brother. Can the crew help Fribbet find the courage he needs? Fribbet the Frog and the Tadpoles is a wonderful story of friendship. I love how the crew and Captain No Beard encourage Fribbet to share his troubles with them and how they work together to help him face his fears. The story also inspires children to use their imagination just like Captain No Beard and his crew as they venture into the unknown on a ship that doubles as a bed and carpet that transforms into the sea. The vibrant and lively illustrations will leave children giggling with delight. This was such sweet book! The family values presented here as well as the learning experience and use of imagination definitely sold this book for me! The way the siblings talk to one another and the lesson learned at the end, is a fabulous way to bring youngsters together and learn from a good book. The frog's life-cycle was also nicely illustrated and explained so kiddos get to learn and see what frog's look like throughout their lives. I liked how the author showed that even though siblings c This was such sweet book! The family values presented here as well as the learning experience and use of imagination definitely sold this book for me! The way the siblings talk to one another and the lesson learned at the end, is a fabulous way to bring youngsters together and learn from a good book. The frog's life-cycle was also nicely illustrated and explained so kiddos get to learn and see what frog's look like throughout their lives. I liked how the author showed that even though siblings can be bothersome sometimes (*innocent smiley face*) they are worth every minute of their trouble! The only thing that could have made this book better would be the illustrations, I feel that if the illustrations would have been more "crisp" and the colors deeper, the book would have engaged the younger audience better, but I still loved this book (and so did my 2 year old brother!) and I give it 5 out of 5 stars! Recommended to all parents (or siblings) as a fabulous kid's book! Captain No Beard and his crew always bring great adventures and this time is no exception. A troubled crew member brings the oportunity of helping a friend and learning a thing or two. For a girl who loves frogs and considers tadpoles one of the best wonders of nature, this book is a dream come true. This book is remarkable because not only because it allows children to learn about the life cycle of this amphibian but also it shares an important life lesson. A new sister or brother is one of those Captain No Beard and his crew always bring great adventures and this time is no exception. A troubled crew member brings the oportunity of helping a friend and learning a thing or two. A new sister or brother is one of those experience many kids have to go through and there is no easy or normal way to live the change of a new family member. There is fear, jealousy and uncertainty but also happiness. I think is really smart to show kids helping other kids coping with this situation. This book has short simple sentences that allows the kids to go fast through them but understanding the story and enjoying it. The illustrations are excellent, colorful, vivid and expressive. This darling book from the author's Captain No Beard series features Fribbet the Frog. Fribbett finds out that he has a lot of siblings now who mess with his stuff and just makes tons of messes and seemingly make his life miserable. He has a real problem but eventually tells his friends. This book is just about as much about friendship as it is growing family dynamics. Children come to learn that new siblings in the house does not mean they are any less apart of the family. In fact, the learn that This darling book from the author's Captain No Beard series features Fribbet the Frog. This book is just about as much about friendship as it is growing family dynamics. Children come to learn that new siblings in the house does not mean they are any less apart of the family. In fact, the learn that they can teach their siblings things they already have learned. This book introduces in brief, a brand new crew member to the ship of the name of Zachary. Congratulations to the author and the crew too! I love this series and just like in all the books I have read thus far, there is always a lesson to be learned. I love that the author allows play time to be full of imagination and good ole' fashion fun! Kuddos on another great book! Carole P. Roman takes our imaginations on another adventure with Captain No Beard and the gang in Fribbet The Frog and the Tadpoles. Fribbet the frog is crying and scared, so Captain No Beard and the gang is determined to figure out why! Turns out things are changing at Fribbet's home and he isn't sure he is happy about it, but sharing his problems with his friends just might be the cure! 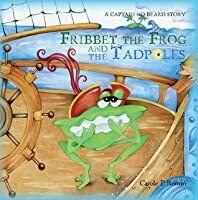 Carol P. Roman always delivers a swashbuckling tale filled with friends and plenty of valuable life lessons w Carole P. Roman takes our imaginations on another adventure with Captain No Beard and the gang in Fribbet The Frog and the Tadpoles. Fribbet the frog is crying and scared, so Captain No Beard and the gang is determined to figure out why! Turns out things are changing at Fribbet's home and he isn't sure he is happy about it, but sharing his problems with his friends just might be the cure! Carol P. Roman always delivers a swashbuckling tale filled with friends and plenty of valuable life lessons with the Captain No Beard Series. The beautiful illustrations are paired perfectly with the story allowing the characters and storyline to literally jump from the pages. Children of all ages are certain to enjoy the adventure they will find as they step aboard ship with Captain No Beard and the gang. A wonderful series perfect for boys and girls! Fribbet the Frog has a problem but he’s too scared to tell his friends. After much coaxing, he reveals that his lily pad is being invaded by many little tadpoles. * Laughs * A new baby in the family is always a scary thing for kids and it takes some getting used to, whether you’re a human, lion or frog. The crew helps Fribbet see being a big brother is a blessing not a problem. Not only is this a story about being a big brother/sister but an excellent science lesson about tadpoles and frogs. Carole P Roman teaches all of us no matter how big a problem is, when we confide in our friends, our fear(s) vanish like water on a the deck of a ship. I loved the quote above from Captain No Beard so much, I have it displayed in my home office above my computer as inspiration. We received this book to give an honest review. Since we have started reading about Captain No Beard and his adventures K and I have fell in love with him and his friends. It is amazing all the adventures they go on right from Captain No Beards bedroom. What a big imagination. In this story Fribbet is scared and as we read on we learn why. He has a bunch of brothers and sisters!!! This is a book about siblings. Fribbet doesn't know what to do because his siblings are loud, and touch his stuff. An We received this book to give an honest review. In this story Fribbet is scared and as we read on we learn why. He has a bunch of brothers and sisters!!! This is a book about siblings. Fribbet doesn't know what to do because his siblings are loud, and touch his stuff. And as we read on we learn that having a brother or sister isn't too bad. Sometimes it is a tough job but it is totally worth it. Ms. Roman is at it again. Writing another wonderful children's book, FRIBBET the FROG and the TADPOLES. Fribbet the Frog is missing! Oh my! It's up to Captain No Beard and the crew to search for the frog and where do they find him? Crying at the stern. Why would Fribbet be crying? It's up to the reader and the crew to find out why. As always there is a lesson to be learned with Ms. Roman's books. This lesson is the value of sharing and that help when needed is always there. The book has cute illustrations with charming characters. There's just nothing else to say. A lovely, charming children's book from a talented author. Also, this book isn't just for children, it's for those young at heart. I was given a complimentary copy of FRIBBET THE FROG AND THE TADPOLES from the author, Carole P. Roman for my view of the book. Fribbet the Frog and the Tadpoles, award-winning book by Carole P. Roman, is number eight in the Captain No Beard series for young children ages 4-8 years old. Fribbet the Frog is one of the crew on The Flying Dragon and he can't be found. As the rest of the crew search, they find him hiding and crying. His home is changing, there are all these little tadpoles around and Fribbet doesn't know what to do. 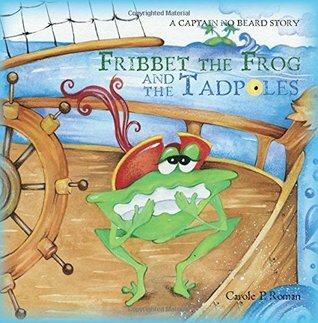 The team works together again to help Fribbet understand that being a brother is a good thin Fribbet the Frog and the Tadpoles, award-winning book by Carole P. Roman, is number eight in the Captain No Beard series for young children ages 4-8 years old. Fribbet the Frog is one of the crew on The Flying Dragon and he can't be found. As the rest of the crew search, they find him hiding and crying. His home is changing, there are all these little tadpoles around and Fribbet doesn't know what to do. The team works together again to help Fribbet understand that being a brother is a good thing. The brightly colored whimsical pictures will keep the interest of youngsters as they read or are read to. An engaging, entertaining book to take young readers on a pirate ship ride and remind them that being part of a family might be hard work but it's worth it. I received a complimentary copy of the book from the author and was not required to write a review. The opinions are my own. When Cabin girl Cayla spills a bucket of water Captain No Beard starts calling for Fribbet the frog to clean it up. When he does not answer the other members of the ship, Polly Parrot and Hallie are very concerned. They find Fribbet crying in the corner. The crew is concerned and want to help Fribbet as that is what friends do. By asking Fribbet what is wrong they are able to find out that he is upset about all the new frogs that are now living in his home. The crew explain how having sisters or b When Cabin girl Cayla spills a bucket of water Captain No Beard starts calling for Fribbet the frog to clean it up. When he does not answer the other members of the ship, Polly Parrot and Hallie are very concerned. The crew explain how having sisters or brothers is not a bad thing. Captain No Beard explains how Cayla who gets into trouble sometime is worth it as being a big brother is lots of fun. The other members explain about having a new sibling can be a lot of fun. Great idea for children whose parents might be expecting an addition to the family to prepare them for it. Once his friends realize Fribbet's problem, they listen, reassure him, and of The group of friends on board The Flying Dragon are back to help each other out again in the next Captain No Beard Story. Fribbet the Frog has gone off to be by himself because his is upset. After his friends finally find him and with some coaxing, Fribbet finally decides to share what is bothering him. He reveals that he is a bit frustrated having to share his toys and his parents with 21 new baby brothers and sisters. Once his friends realize Fribbet's problem, they listen, reassure him, and offer suggestions. The crew members share the value of friendship and the reminder that friends are always there for each other. If you have kids and they like pirates this would be a fun series I have had the pleasure to review many of Carole P. Roman's books. These books are so sweet, and always have a good message with them. The illustrations are magnificent, and so much fun for kids. Captain No Beard and his crew are on another exciting adventure. Everyone is cleaning and getting the ship ready to go but where is Fribbet? He isn't among those that are helping. Polly finds him and asks why he is crying? He tells his story about what is going on at home. He finds a bunch of eggs that morph into tadpoles and then into frogs. And Fribbit is scared. Captain No Beard comes to the recue and explains to Fribbit about brothers and sisters and about love. This is a wonderful book to ex Captain No Beard and his crew are on another exciting adventure. Everyone is cleaning and getting the ship ready to go but where is Fribbet? He isn't among those that are helping. Polly finds him and asks why he is crying? He tells his story about what is going on at home. He finds a bunch of eggs that morph into tadpoles and then into frogs. And Fribbit is scared. Captain No Beard comes to the recue and explains to Fribbit about brothers and sisters and about love. This is a wonderful book to explain to young kids when a new brother or sister arrives. And there is a bit of a science lesson about frogs and tadpoles as well. This is a great book for kids who can read by themselves or for parents to read. And the illustrations are colorful and bring the story to life. This is the next book in the Captain No Beard series. When Cayla drops a bucket of dirty water on deck, everyone realizes Fribbet the frog is missing. They find him and learn he is distressed. It seems Fribbet’s home is invaded by tadpoles. As a reader we learn about the changes a frog goes through from egg, to tadpole, to frogs. We learn how valuable a lesson it is to listen to others and help them through their problems. This invasion of siblings for Fribbet is something Captain No beard can i This is the next book in the Captain No Beard series. When Cayla drops a bucket of dirty water on deck, everyone realizes Fribbet the frog is missing. They find him and learn he is distressed. It seems Fribbet’s home is invaded by tadpoles. As a reader we learn about the changes a frog goes through from egg, to tadpole, to frogs. We learn how valuable a lesson it is to listen to others and help them through their problems. This invasion of siblings for Fribbet is something Captain No beard can identify with. He also shows how special it is. The ending has a surprise for one of the other crew members. Another wonderful way to teach children simple lessons. Captain No Beard and the crew are enjoying another adventure. Well, not quite everyone. Fribbet is having a little meltdown. His tadpole brothers and sisters are making so much noise he can’t hear himself think. Fribbet realized being a big brother is hard work. Will Captain No Beard help Fribbet understand the importance of having siblings and the responsibility of being a big brother? You’ll have to read the story to see. Author Carole P. Roman has created a story siblings will relate to. The c Captain No Beard and the crew are enjoying another adventure. Well, not quite everyone. Fribbet is having a little meltdown. His tadpole brothers and sisters are making so much noise he can’t hear himself think. Fribbet realized being a big brother is hard work. Will Captain No Beard help Fribbet understand the importance of having siblings and the responsibility of being a big brother? You’ll have to read the story to see. Author Carole P. Roman has created a story siblings will relate to. The colorful illustrations bring heart to the story. Young readers will enjoy the comradery of the characters. Easy to read sentences will boost readers confidence as they navigate through the pages. My 3 year-old twin grandchildren and I enjoyed this latest swashbuckling adventure of Captain No Beard. We've read all the other stories in the series. This is just the latest in author Roman's mild mannered adventure series with the Captain and his crew, which teach valuable lessons while being disguised as fun books. This time around Fribbet the Frog is the star of the story and the crew (and readers) learn about sibling jealousy - and love. Well told with colorful, fun illustrations, this is another winner. My children enjoyed this story. The illustrations are funny and colorful. The story is sweet and shows how working together can be helpful. The author also talks about accepting people and loving them for who they are. Since the story showcased siblings, my children enjoyed sharing their experiences too. I When Fribbet goes missing the crew finds him crying. Captain No Beard and his crew must find out why Fribbet is so upset and help him solve the problem. They work together to help their friend. In this Captain No Beard story my favorite character, Fribbet the Frog, has a problem. He is crying his eyes out, and he has the weight of the world on his shoulders. The rest of the crew tries to understand his problem and help him through it. Fribbet feels left out because Mom and Dad are busy with all of the new tadpoles, but the crew helps him learn all about being a big brother. The Captain No Beard stories are the imaginary adventures of Alexander and his friends. They are fun, educational In this Captain No Beard story my favorite character, Fribbet the Frog, has a problem. He is crying his eyes out, and he has the weight of the world on his shoulders. The rest of the crew tries to understand his problem and help him through it. Fribbet feels left out because Mom and Dad are busy with all of the new tadpoles, but the crew helps him learn all about being a big brother. I read this with a group of children in our library and book review club at lunchtime. The children were aged between 6 and 7 years. They enjoyed the book and we discussed what it is like to have brothers and sisters and how it can affect us. One of our 6 year old girls said it's "good to have brothers and sisters" even though her little sister sometimes annoys her. These books are a great way to start discussions. I loved this book. I think it teachs children that having siblings can be a little crazy and hard at times but you still need to love them. I loved the end of the book, when their back home in bed, and their Mom comes home with a little boy named, Zachary. Overall: I loved this book. It is a great book!! Named to Kirkus Reviews' Best of 2012 for her first book, award winning author Carole P. Roman started writing as a dare from one of her sons. Using an imaginary game she played with her grandson as a base, Captain No Beard was born. "Captain No Beard- An Imaginary Tale of a Pirate's Life" has not only been named to Kirkus Best of 2012, it received the Star of Exceptional Merit, and won the Pinnacl Named to Kirkus Reviews' Best of 2012 for her first book, award winning author Carole P. Roman started writing as a dare from one of her sons. Using an imaginary game she played with her grandson as a base, Captain No Beard was born. "Captain No Beard- An Imaginary Tale of a Pirate's Life" has not only been named to Kirkus Best of 2012, it received the Star of Exceptional Merit, and won the Pinnacle Award for 2012. "Pepper Parrot's Problem with Patience" Book 2 in the series, received 5 Stars from The ForeWord Review The Clarion Review. Strangers on the High Seas has won second place in the Rebecca's Reads Choice Awards 2013. It has followed with six more books to the series. This year, Captain No Beard and the Aurora Borealis was named to Kirkus Best 2015. The entire cultural non-fiction series If You Were Me and Lived in... was named Best Series by Shelf Unbound. She has begun work on two new series that will be released in early 2016. Her nonfiction series, "If You Were Me and Lived in..." combines her teaching past with her love of exploration and interest in the world around us. The debut book in the series, "If You Were Me and Lived in...Mexico" has won the Pinnacle Award for Best in Children's Non Fiction 2012. France, South Korea, and Norway. Rebecca's Reads has given If You Were Me and Lived in...Norway an honorable mention in the 2013 Choice Awards. If You Were Me and Lived in ...France won second place. ForeWord Review has nominated If You Were Me and Lived in...France for best in children's non fiction literature 2013. They will be followed with Kenya, Turkey, India, and Australia. She plans to do Portugal, Greece, and Argentina next year. There are now 22 books in the series and include a trip to Mars in 2054. Carole was recently featured in a two part article on Forbes.com where her book, Navigating Indieworld was discussed along with her self-publishing success.